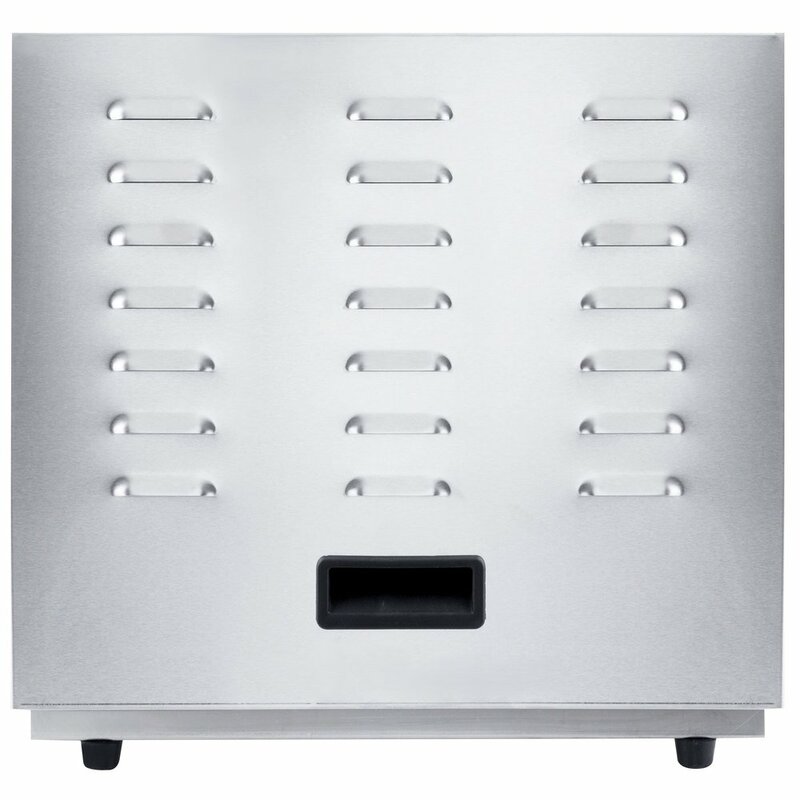 Satisfy the versatile appetites of your hungry customers with this Avantco CFD10 10 rack stainless steel food dehydrator with a removable door! 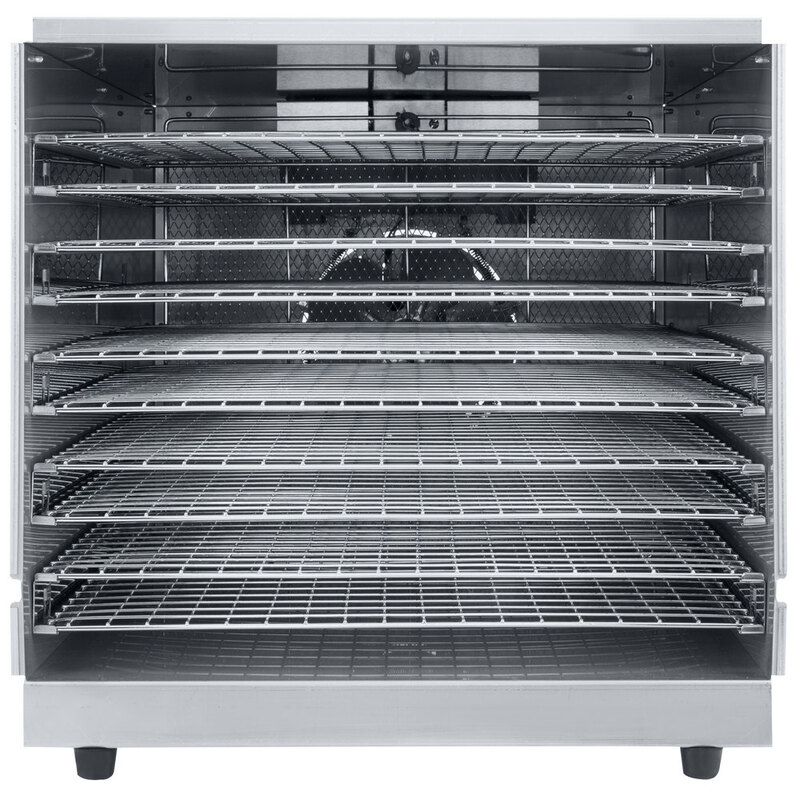 Perfect for butcher shops, specialty stores, and health food stores, this unit allows you to dry out your most popular jerky, granola, fruits, vegetables and more! What better way to show that you care than by providing guests with sweet and salty snacks that are exceedingly healthier than potato chips? Featuring a temperature range of 85 to 160 degrees Fahrenheit. With a 12 hour timer, you'll be able to multitask with confidence, knowing that your savory snacks are being prepared perfectly. 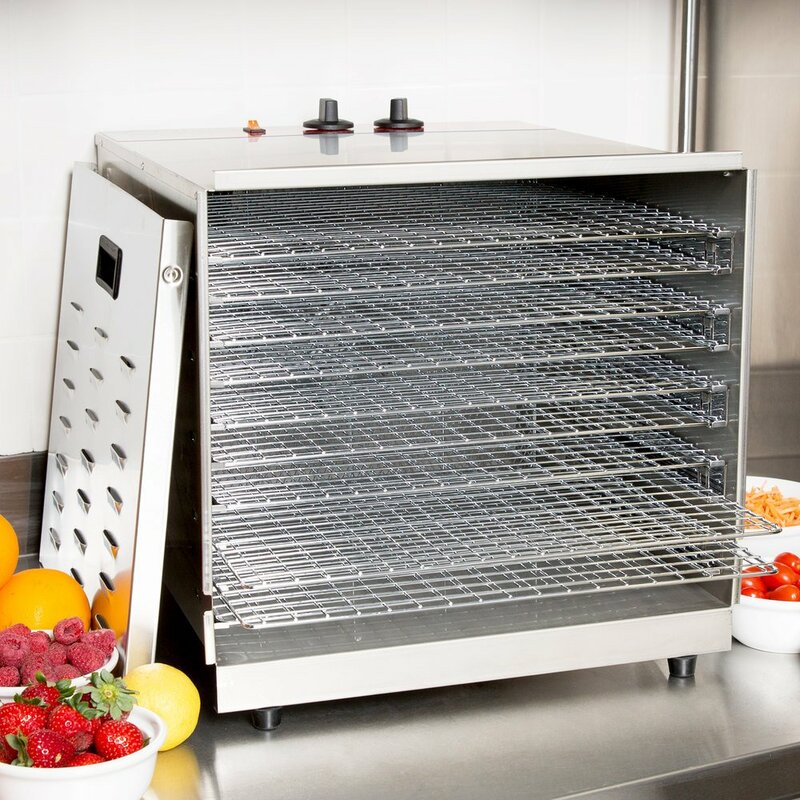 Boasting an attractive stainless steel interior and exterior, the durable CFD10 dehydrator features 10 chrome-plated 17" x 20" removable racks, which makes cleanup a breeze. 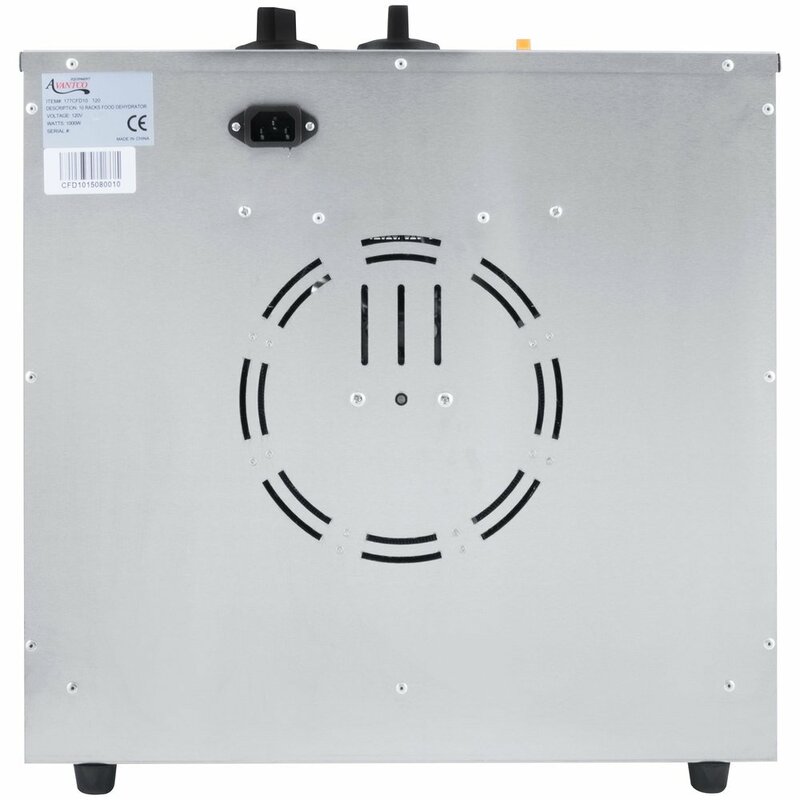 The dehydrator is also equipped with removable guide rails and a door with an easy lift-off design, providing you and your employees with a simple machine that takes minimal effort to maintain. This machine requires a 120V electrical connection. This Food Dehydrator is perfect for dehydrating meringue, fruit garnishes, and anything else that you may need to dehydrate. The stainless steel finish makes it easy to clean and looks great in any commercial kitchen! This dehydrator has more than paid for itself in one season. We have dried everything from corn and blueberries to zucchini and pears, and it was running the entire time our garden was producing. Combined with a vacuum sealer from Webstaurant, lots of extra bags, and oxygen absorbing packs, it allowed us to enjoy our garden all winter long. 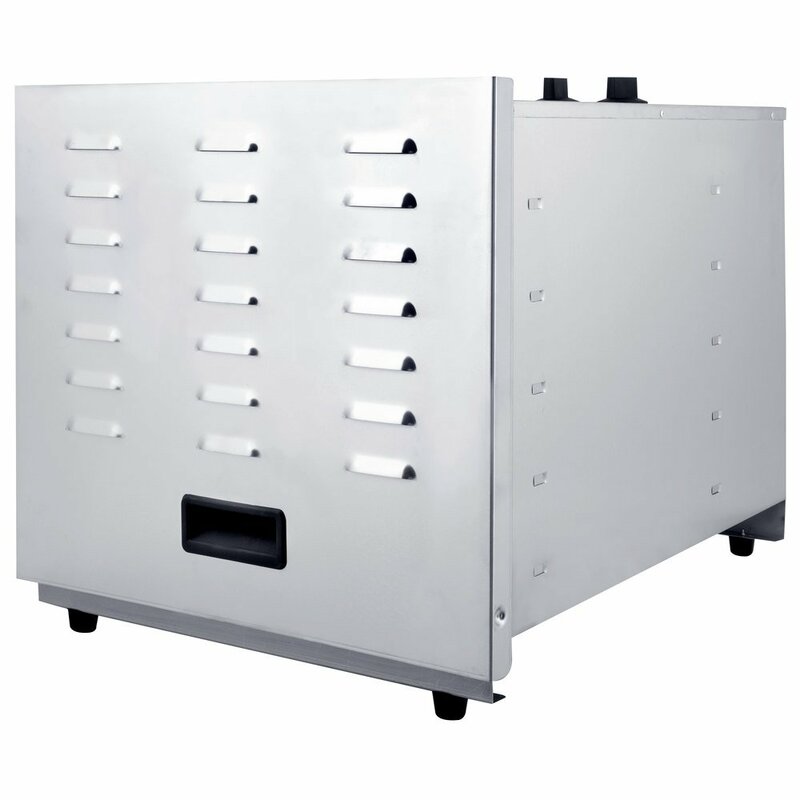 The Avantco CFD10 Ten Rack Stainless Steel Food Dehydrator with Removable Door - 1000W is a great option for drying mushrooms, herbs and fruits for storage and selling at farmer's markets. Love this dehydrator, i use it to make my own jerky, started out using it for mostly beef products but then graduated to fruit and even salmon. I ordered this unit about a month ago. I have already ran 135lbs of jerky through it and it has performed flawlessly. It dries at an almost perfect even rate. You might have to take a tray out and rotate it, but that is no problem at all. It is the best dehydrator i have ever used and the price places it at second to none for its size. The only thing wish could be changed is--- it was twice the size, even if it was twice the price. It would still be hands down best. 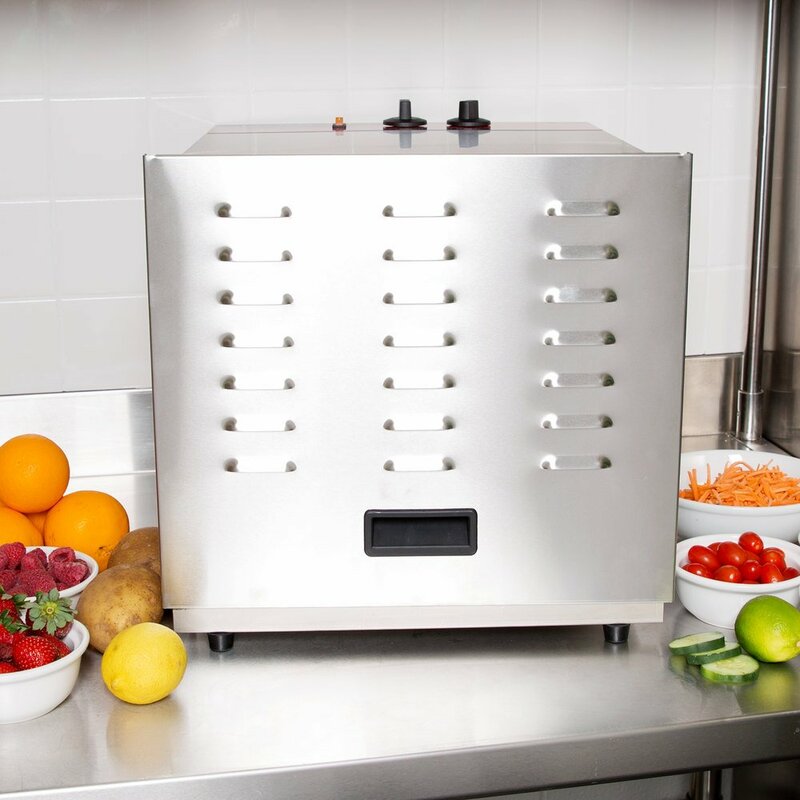 This dehydrator has a lot of room inside, is very quiet and very easy to clean, but does not dehydrate food very fast. I have been doing apples for over a week and the Avantco takes twice as lone as my excalibur 600 watt dehydrator 9 tray. The fan seems to produce very little air movement and the 1000 watt heating element seems to cycle very often. It does ok on very small loads but when full loaded it is very slow. I love many of its features but it just does not dehydrate the food very fast. This is an excellent dehydrator. I have used this for a variety of meats, produce and herbs. Every time I use this I am greatly pleased with the results. Small enough to fit underneath a worktable yet spacious enough inside to fit a large amount of food. 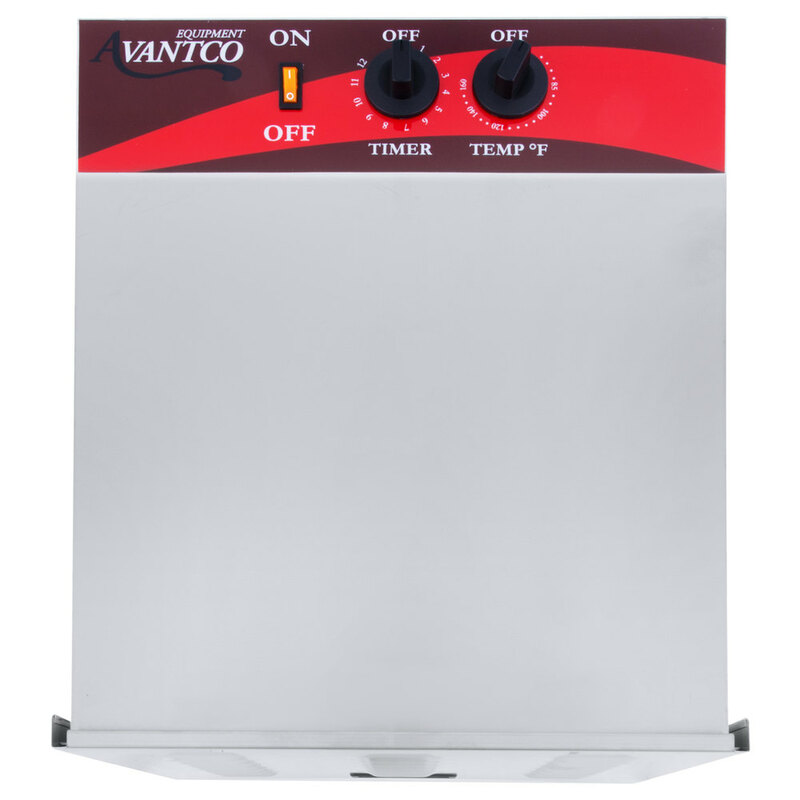 I love the avantco stainless steel dehydrators (#177CFD10) . WORKS AWESOME. and easy to clean I use it for jerky mainly but have dehydrated hot peppers too. No complaints. Very impressed. WHOA NELLY, this is one fabulous dehydrator. It's high strawberry season, and this baby is cranking out dried strawberry "candy" like nobody's business. My kids can't get enough! Excellent product! We like to use this for our dog cookies and it works like a charm. Would love to use it to dehydrate banana chips, too! The reviews on this dehydrator were excellent and rightfully so - it's amazing! So far I've made beef jerky and dehydrated some fruit and vegetables. The product works as expected and does the job very well. The price is excellent, especially compared to competition. I have used this dehydrator once so far with a variety of different produce and it worked very well. After 24 hours without rotating the racks, the moisture was completely removed from everything with the exception of a few small pieces. The only complaint I have is that small items will fall through the racks when dehydrated. I was told that it is not recommend to use wax or parchment paper to eliminate this issue due to the need for more even heat distrubution. This makes sense, however, I believe even heat distribution can still be achieved considering the size of the dehydrator or through the use of racks that are not so porous. I originally wanted to sell my smaller dehydrator, however, because of this I may not be able to. I am looking forward to using this dehydrator more going forward. Really impressed with this dehydrator. I’ve had my eye on a widely popular name brand dehydrator for years, but the cost paired with the cheap materials, deterred me from purchasing. If it hadn’t been for all the reviews for this one, I’d have thought it a cheap joke. I’m pleased to say it’s not a joke, and it’s not cheaply made. I’m looking forward to many years of use, and the ability to cut our grocery costs by sprouting our own nuts and dehydrating our own herbs, among other things. I highly recommend this unit! Very nice product! Easy to assemble/use/clean. Very quiet. Cool looking. The timer and the thermostat work well. Highly recommend it! The word of advice: do not load the fruits and the sauce (for the fruit leather) at the same time - it will take twice as much time to dry it because of the sauce high moisture level. Real work horse in our restaurant. Use for drying vegetables, fruits and making jerky. Storage space is a premium in our tiny restaurant, but consider this a must. Why spend three times the amount for the excalibur dehydrators when you can get this at such a great price?! We love this dehydrator and have it in constant use and it still works very well! I am happy to have finally received this dehydrator. I have not used it as yet but it looks great and heavy duty as use for a commercial use. Works well for dehydrating my dog treats. The automatic shut-off timer is really a life-saver, too. I can fit about 1000 dog treats in here (15 sq ft). Good product! Love this product so much! So easy to use and very even heat distribution! I used it for dehydrating fruits and they were fantastic! Next up: herbs and garlic! This is going to be fun! Top quality product!!! After shopping for a while this dehydrator took top spot on my list maily because of it's design and quality. Upon receipt I was impressed with the workmanship in the construction. Using it impressed me even more. It is quiet! So quiet that I had to open it up to verify it was operating. The capacity is more than enough. I will do bigger batches in the future. The only thing that surprised me was the absence of an indicator that the timer was done. I didn't hear a tone if there was one. I highly recommend this product to anyone who loves jerky. You will never buy prepackaged jerky ever again. I love this dehydrator. Easy to use, Easy to clean. I made great jerky in it. I have also dried , peas, corn, mushrooms, green beans, shallots, hominy, and broccoli. They all turned out good. I cannot stress enough how wonderful this little gem is, especially how quiet the motor runs, even for a home kitchen. Would highly recommend this steal of a deal!!! I love this product! I have many, many friends who dehydrate. They all boast on their Excaliber dehydrators. I tell them that they missed the boat. Excaliber is so expensive and this Avantco dehydrator is so affordable and yet has 10 racks, a very simple door that is easy to open and close and temperature control high enough to dehydrate meats! Once I fell in love with this product, I bought a stainless cart for it and the combination is perfect for my in-home use. I have dehydrated tomato skins for making tomato powder, bananas, bananas ,bananas, herbs, celery, and peppers. I also use it as a proofing box, and have used it to set my ferments on and around to keep them at a warm and constant temp. All worked well. It is easy to clean. The racks are easily removable. The fan is quiet and the unit doesn't get too hot. I recommend this dehydrating unit to many people. It is comparable to Excaliber in function, and much less expensive. 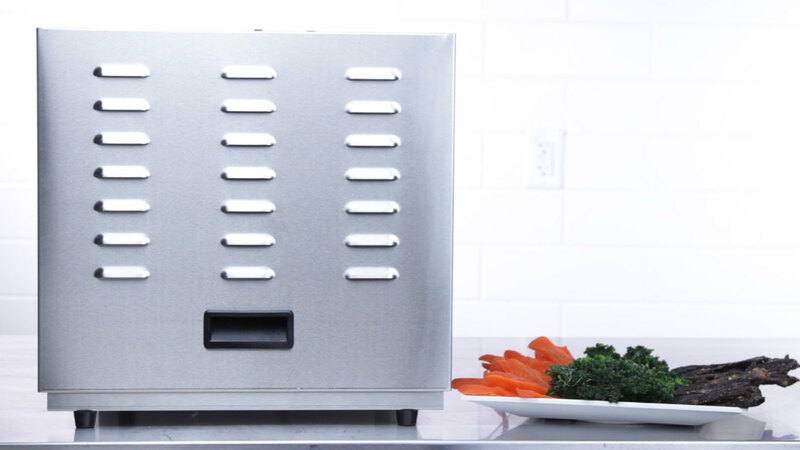 This stainless steel food dehydrator is everything we were looking for. It heats up fast and is easy to clean. The ten racks allows us to dehydrate multiple items at once. This dehydrator is a must have! Excellent product. I purchased this because of the mechanical timer and temperature knobs. My previous dryer was essentially the same with an electronic control pad which burned out after two years of use. This unit has easy to clean trays and works very well on all foods. Highly recommended. Also, replacement parts are available from Webstaurantstore.com.